Organize | When you have Hamberger's you make Happy Meals! Comments Off on Directing education starts early. Lately I have been sending myself on major guilt trips. Alex is to a super fun and exciting. I really love to watch him play. He plays really pretty well with other kids (obviously we are working on the sharing thing, but in general he does great!) and he plays well by himself too! You will often hear him singing as he goes about whatever it is he is in to, or actually more often making a vroooooooming noise as he pushes around our little bissel sweeper. I know that these early years are so important in the development of kids. They learn sooooo much in the first 5 years of their lives, especially compared to the rest of their lives. As Alex has gotten older, it has become easier to just “let him play” by himself. And while there is nothing wrong with that, I personally have started to feel like I am not helping him make the most of these years. So I came up with a “schedule” for Alex’s daily activities when he is home with us. I use the term schedule lightly. There are no time allotments. For two reasons. 1. If something falls behind schedule, I start stressing out. 2. Our family operates best with more flexibility. 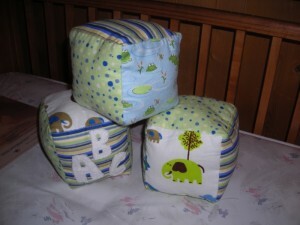 I think that allowing flexibility and creativity with kids is a good thing! Here is what I came up with. Fill in with naps for K as needed. Anyway, I don’t know if this will actually be beneficial to Alex more than his current life or if it is simply to eliminate my guilt. But either way I kinda think it will be a good thing. We have just started using it, so I will let you know how it goes, but I have to say it kinda has me excited! …now I need to make a parallel schedule for me! 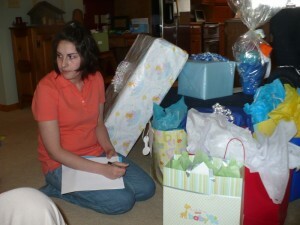 But I did have two wonderful showers last weekend… Baby showers that is!!!! On Saturday I had a shower with Jason’s side of the family. It was a yummy yummy brunch! decorated with adorable outfits, and little froggies. It was really cute. 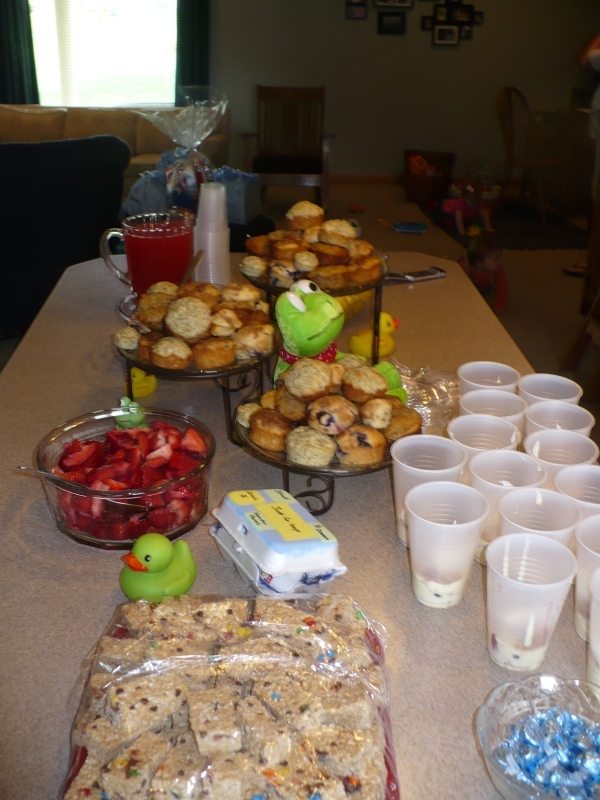 Muffins, Fruit, Parfaits, Egg casserole, Granola and Juice/punch. Just look at this delicious spread!!!!! It makes my mouth water just thinking about it…. 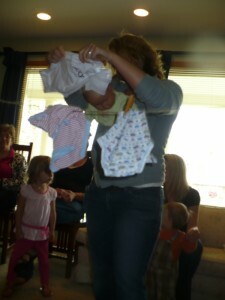 Some of the cute outfits I got, I can’t wait to put them on “Sully”. The baby doesn’t look so comfortable… but the clothes pins on the shirt is very creative! 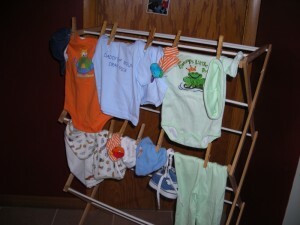 Ahhh I have a feeling I will be stealing this idea from Kelly and use a front pack or sling for when I hang out the laundry. Look at all these gifts! I am glad Ang was recording everything for me! Then on Sunday, I had a joint family shower with my cousin. She is due just 6 days after me!!! I of course didn’t get any pictures of it, because I forgot my camera 🙁 Thankfully my Aunt will be getting me doubles. We had chicken salad and fresh fruit. Chips, pretzels, YUMMY chocolate/raspberry cake and ice cream. We visited and talked pregnancy and babies. It is fun because of the 7 of us that are married, 5 are either pregnant or have had babies within the last 8 months. 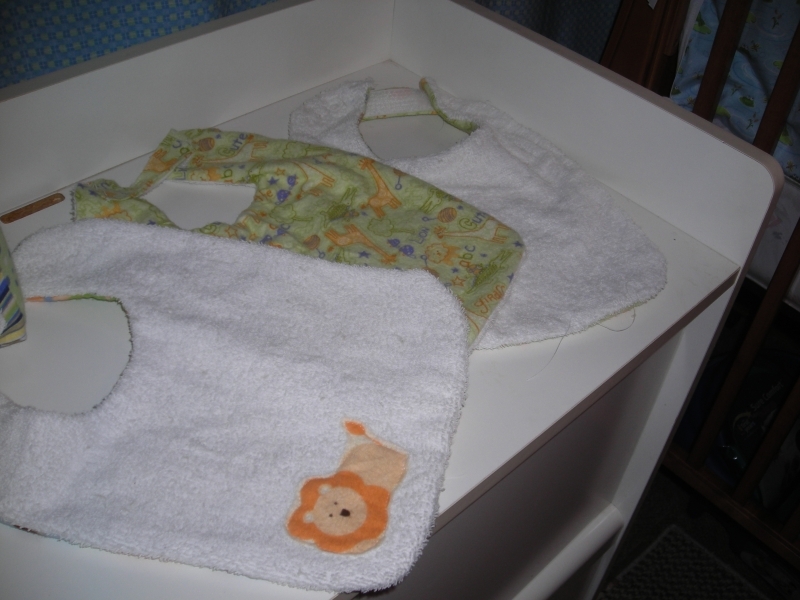 Between both showers I think we have just about everything we need for right when the baby is born! Now I just have to wash the linens and clothes and organize it all. 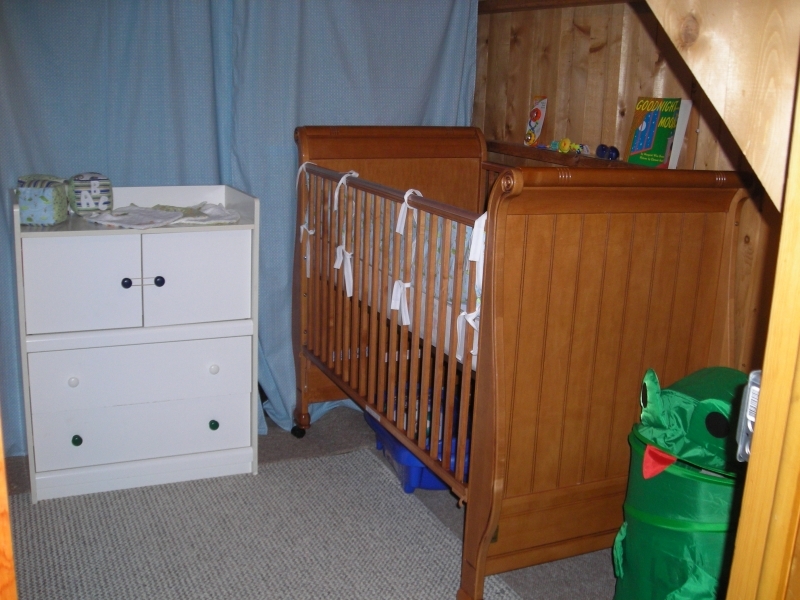 As you can see my *almost* finished nursery needs a little more orgnaizing now. Thanks everyone for the wonderful weekend, and helping us get what we need for when “Sully” comes!!! I have just a few more things to finish up in the nursery (finish binding my quilt, finish one more bumper, and put away all my baby’s adorable little clothes and things) but I thought I would share a quick update on the *almost* finished nursery. 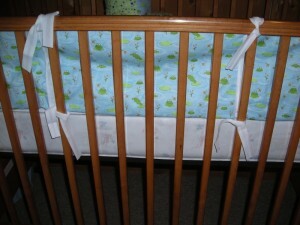 My secret diaper storage, cleverly hidden behind the crib. 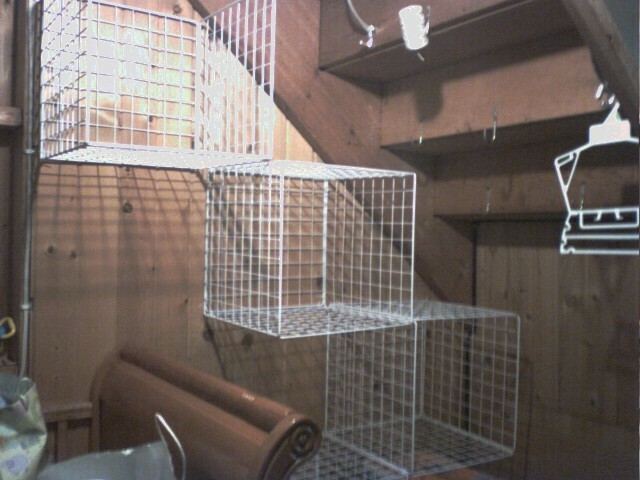 Extra storage for clothes and bedding etc. Some bibs that I made. If you want to make more projects like these, I found the patterns here. 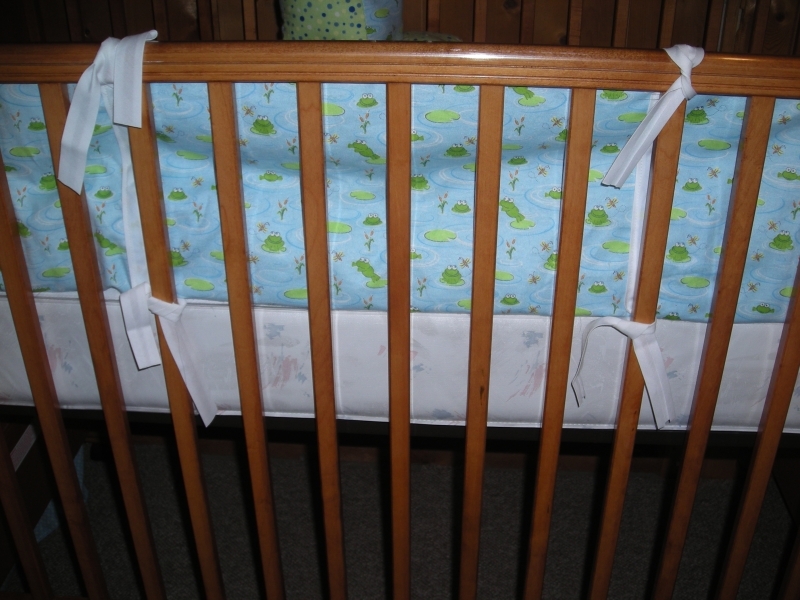 You can save a TON of money by making your own things, and buying second hand. 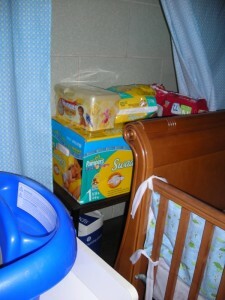 I am just about ready to add up the total of what our nursery expenditure has been. I’ll post it when we do. All of that stuff from one storage room… I mean nursery… had to go someplace. So Gwen and Jason went through another storage room and reorganized it. It some of Jason’s and my stuff, some of Gwen’s stuff all mixed together and not totally organized. This is what the room started out as…. Jasper decided to help, so he picked up whatever the broom left behind. I don’t have any pictures of it, but after everything was out of the rooms it got all re-arranged. Some went to other places upstairs. Some stuff went into the garage sale pile. 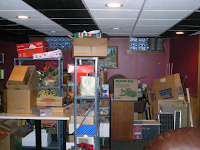 Our stuff is in boxes stacked in the basement. 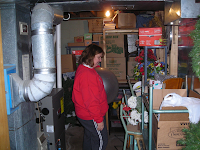 Once things were re-organized a lot more fit into this second storage room. Its not all put away, but it is a lot better! Thanks Jason and Gwen for all of your hard work, I really appreciate it! 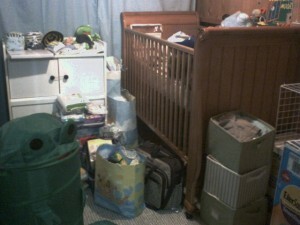 This is the room before hand. Babies are small, but they still do need a little room. Yeah looks a little ambitious but bare with us. Jason and Gwen worked hard… making some good progress guys! 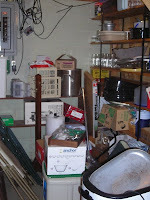 All that stuff had to go somewhere, so it moved out into the main part of the basement. Normally this kind of stuff would bother me, but it is for a good cause, so I slept very well last night! Suddenly putting a nursery in there is looking more promising. The shelf is all moved out, room is empty and I have the beginings of a nursery! The internet is a WONDERFUL tool to get information about what is going on with your baby & your body, as well as information about different products. Additionally, it is a great resource for deals and coupons. Which all of us of course love! But with all of these news letters, coupons, and quality control reports that arrive daily in your e-mail inbox. It can become a tad bit overwhelming. How do I find that e-mail about the family get together in the middle of the 27 e-mails from baby-gaga and what to expect? The answer is simple: get a second e-mail address. It keeps your main e-mail box clear of the “spam” and easy to find that important e-mail that tells you what to bring to the family dinner. At the same time it still allows you to benefit from the resources on the web. There are several web based e-mail servers you can use (such as Yahoo or Google -gmail) And of course the best part of the web based e-mails is that they are free! OK, so it is time for a little honesty. I am not organized. In fact (as my family will attest to) I am quite disorganized. I have dreams of being one of those people who has a place for everything and everything in its place. Believe it or not a lack of organization bothers me, but it also depresses me to the point where I just want to ignore it, therefore making it worse… and so on. So in attempts to get more organized (baby steps people) I have tried little things. Like writing all of my class plans in one notebook that is labeled ‘debate class’, so when I teach again I don’t have to look for miscellaneous papers. This might sound rather obvious to you more organized people. But to me it was a breakthrough. 😛 Well when we knew we would be parents, I knew that I needed to get organized. But I can’t do it on my own. So I started to price pregnancy organizers. (Its like keeping all of our baby plans in one notebook) those things can get EXPENSIVE! 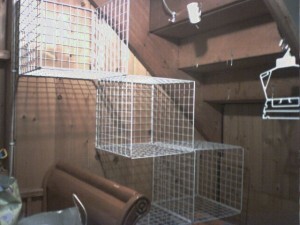 Then I found this amazing organizer, at my favorite price, FREE. Just because it is free (actually it was 3.99 b/c you have to pay for S&H but that was a small price to pay) doesn’t mean that they skimped. I love it and could go on and on about it, but since I already have gone on and on I’ll give you my highlights. * 3 pages for thank yous to be sent out. * Suggestions for saving time around the house. * 5 Pages of books and websites to check out. Of course since the book is free there are a lot of advertisements to pay for the book. But they aren’t overwhelming and they are helpful (some coupons are involved!) I have learned that the quickest way to overspend is to not have a plan. And this organizer certainly helps you to develop a plan. So in the long run I would say its a pretty good return on $3.99. When you have Hamberger's you make Happy Meals! is powered by	WordPress 5.0.4 and delivered to you in 1.107 seconds using 48 queries.